Rock ‘n’ Roller Classic Slot Guide & Review - Casino Answers! 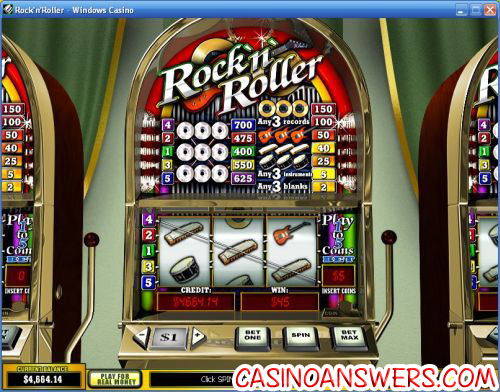 Rock’n’Roller is a 3-reel, 5-line multi-line slot machine developed by Playtech. You can play the Rock’n’Roller slot machine at Vegas Red Casino and Omni Casino. To play Rock’n’Roller, you can play the $1 coin value or switch it to $0.05, $0.10, $0.25, $0.50, $2 or $5. Your next step is to either spin the reels using “Bet Max” to use “Bet One” to select 1-5 coins. With each coin you bet, you will activate another payline. Casino Answers recommends you play the maximum bet at your choice of coin values to be eligible for the top jackpot. The lowest total bet you can make on the Rock’n’Roller slot is $0.05, with the highest being $25 per spin. To play Rock’n’Roller, press the “Spin” button or pull the lever at the right of the slot machine for a truly classic feel. The top jackpot on the Rock’n’Roller slot machine is the Platinum Record symbol. On the fifth payline, three of these symbols will payout 700 coins. In order to be select line 5 and be eligible for the 700X top jackpot, you must play the maximum bet of 5 coins on Rock’n’Roller. There are 8 winning combinations on the Rock’n’Roller multi-line slot machine. They include (1/2/3/4/5 line payouts in parenthesis): any 3 blanks (2), any 3 Instrument symbols (5), 3 Drum symbols (5), 3 Harmonica symbols (40), 3 Electric Guitar symbols (50) any 3 Record symbols (100), 3 Gold Record symbols (150), 3 Platinum Record symbols (400/475/550/625/700). You can find Rock’n’Roller’s autoplay mode under “Menu.” You have the option of using the basic setting of number of spins or you can use the arrows on the left side to expand the autoplay feature into the Advanced Mode. You can set the stop settings of: Jackpot win, single win more than (up to $99,999), overall Win more than (up to $999,999) and overall loss more than (up to $999,999). You can also set the delay between spins to speed up the autoplay. Autoplay can be cancelled at any time by using the “X” button. For those fans of Classic Rock ‘n’ Roll who double as online slots players, you can find the Rock’n’Roller slot machine at Vegas Red Casino! Are USA players able to play the Rock ‘n’ Roller slot machine for real money? Regrettably, American players cannot play for real money at Playtech online casinos at this time. For a rock music themed interactive slot that United States players can play, please read our Rock On iSlot Review or play it now at Rockbet Casino. Where can I play a Rock ‘n’ Roller Flash game for free? To play an Instant Play Flash version of the Rock’n’Roller slot game for free or real money, visit either Vegas Red Casino or Omni Casino. This is the best way for Macintosh and non-Windows players to play the Rock ‘n’ Roller slot machine. How do I win the maximum payout on the Rock ‘n’ Roller slot? To win the 700 coin top jackpot, you must make the maximum bet of 5 coins and have 3 Platinum Record symbols appear on line 5 (bottom left to top right). Is there any good musical fruit machines?